While some decorative painting techniques require special faux painting tools and/or paint glaze, you might be amazed at what you can do with common household items. There are four or five basic tools you need and from there you choose additional tools to create the special effects you want. Tape Measure – Useful when you are masking off areas so lines are straight. Level – Useful when you are dividing a wall into different horizontal sections. Blue tape – Useful for masking so paint only goes where it belongs. Brushes and rollers – Necessary for applying base coat, top coat, and/or glazes. You’ll find a level very helpful, even if your walls aren’t square. Once you know what true vertical and true horizontal is, you have the information you need to “trick the eye” into thinking everything is plumb, even if it isn’t. You can use putty knives and trowels to create Venetian plaster effects or to apply or remove paint and glaze. Stainless steel versions are the best, because they won’t rust and can be used for several types of projects. Purchase a 6″ drywall knife at the very least. You will find a smaller one around 3″ or 4″ wide useful as well. Ragging and rag rolling are popular decorative techniques today. But when it comes to faux techniques absorption isn’t everything. It’s often the result that matters, so your rag could be a plastic shopping bag! Lint-free cotton is a good and inexpensive choice for this technique. The cheapest source of lint-free rags are your old worn out T-shirts. Cut the T-shirts into manageable pieces, usually four sections plus the sleeves. Because the material absorbs paint so quickly, keep several on hand. They’re also good for cleanup. Chamois is another popular material that can be used to create decorative effects. Because it absorbs less paint or glaze than cotton does the effects you produce with this material are less subtle. Chamois is a good choice if you want dramatic contrast. Cheesecloth has an interesting texture and is a popular choice for ragging. 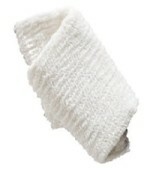 The open weave creates a speckled finish that is a good addition when you’re trying to create a faux-parchment effect. A crumpled plastic bag produces a more distinct texture than absorbent cloth will. Because it spreads the second layer of paint or glaze rather than removing it, you achieve different levels of translucency depending on how firmly you press the plastic into the wet paint/glaze and how scrunched the plastic is. Feel free to experiment with other materials, as well. Saran wrap, crumpled aluminum foil, Kraft paper and even burlap will all produce unique effects. 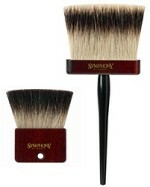 There are special brushes designed just to help you achieve attractive faux finishes. Choose the brush based on the technique and type of paint you’re using. In general, brushes are best for either latex or alkyd (oil based) paints. If the brush says it can be used for both, it is typically inferior in quality. Wide and inexpensive brushes are perfect for applying color washes and glazes. The finish needs to be applied quickly and evenly for the best result, and a brush with greater coverage makes it easier. Invest in a more expensive one if you’ll be using it again, but if the project is limited to one room, save yourself some hassle and just throw it away when you’re done. Dragging brushes have a wide base and fine tip. They’re used for creating “veins” in faux marble finishes. These are available at most large home improvement stores in the painting section. Stippling brushes are used to stipple or “pounce” the surface of the paint. They are useful for creating faux leather looks. Look for a wide, deep brush with squared-off (not tapered) bristles. These can be very soft or fairly stiff, depending on the desired effect. Get out of much of the work involved in faux painting. Choose a roller that helps you get the finish you want. Double or honeycomb rollers allow you to apply two colors at once and can also produce interesting shaded effects. These are more difficult to control than you might imagine. Practice first! Check rollers create a denim-type finish. The roller itself is made of many notched metal disks that remove glaze from the surface of the wall, creating a somewhat faded look. Sponge rollers have an irregular, spongy pattern. They can be used to quickly sponge paint large areas of wall and create a repetitive, uniform look. Using a roller is far less tedious than using a small sponge. Texture rollers allow you to put an additive in the paint and add texture at the same time that you are painting. The surface of the roller will look like a loops of wire. Large, natural sea sponges create the most organic effect. Avoid cellulose kitchen-type sponges unless you’re trying to create a faux brick pattern. Look for sponges that have large open cells and sponges that have the exact opposite, fine delicate cells. For really professional sponge painting, you’ll find using a combination of open cells and finer cells gives you the best effect. Both natural and cellulose sponges absorb paint quickly, so have a few on hand and be prepared to rinse often. Metal and plastic combs can help create a realistic wood-grain finish. Both are dragged through wet glaze to create variations in color. There are two basic types: the rocker and the triangular comb tool. The rocker is used more often. Wood graining tools can also be used to create other fun effects- narrow stripes or wide swirls in vibrant, contrasting colors look neat. Once you have the right faux painting tools on hand, for the type of finish you have in mind, you can get started with one of the most rewarding and cost effective projects you’ll every find in your home.